Jesse and I in the under ground cave, ready to swim in the Cenote. Jesse and I returned from Mexico yesterday. We had such an amazing experience I can’t wait to take another trip down there. 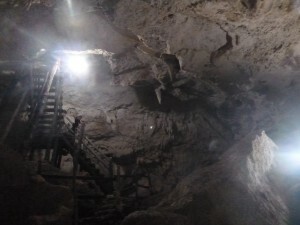 One of the best parts of our trip was the excursion we took with Alltournative Tours. Click on their name to visit the website. If you are going to Cancun or the Riviera Maya you should do one of their tours. 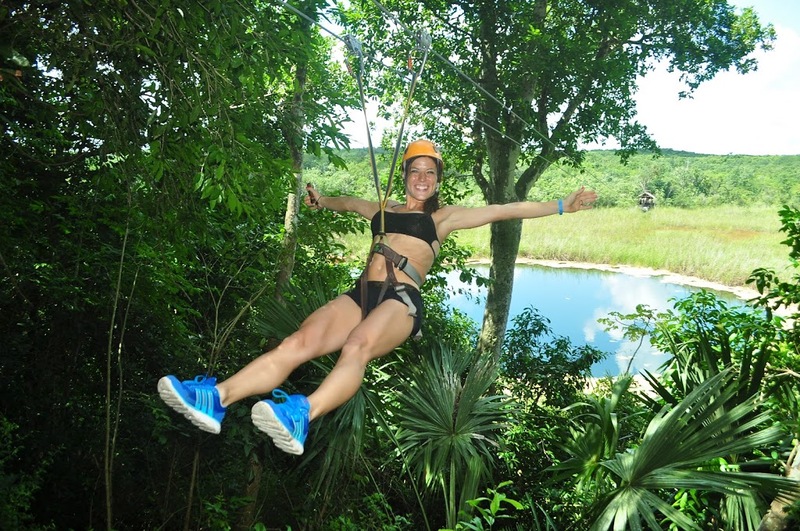 We booked the Coba Mayan Encounter Adventure. Our tour guide was Danique, and our driver was Paco. They were both fabulous. They were knowledgeable and fun. Danique was able to seamlessly explain each activity in several different languages as our group consisted of individuals from the USA, Montreal, Belgium, and Germany. 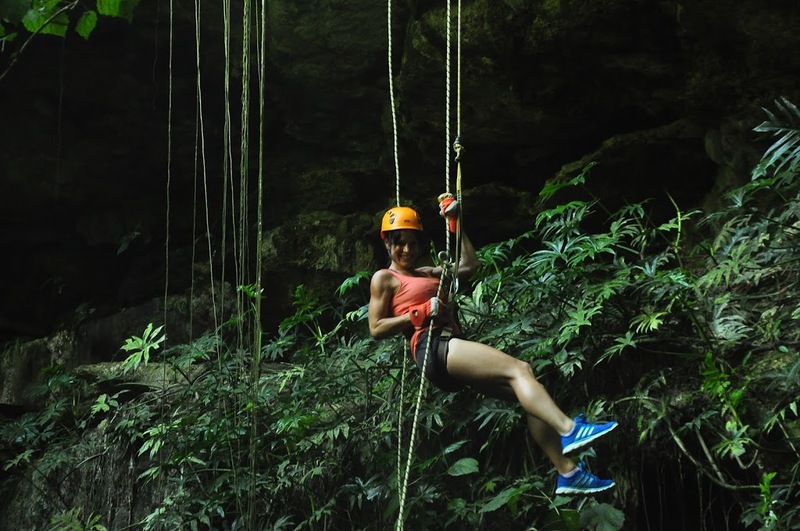 The tour included rappelling into a cenote, riding zip lines through the jungle, swimming in a cenote, participating in a Mayan purification ceremony, and eating a lunch prepared by some of the Mayan people. We ended with a trip to Coba, and climbed Nohoch Mul, the tallest ruin in the Yucutan Penninsula, and one of the few that remain open to the public. Zip Line over the Jungle. 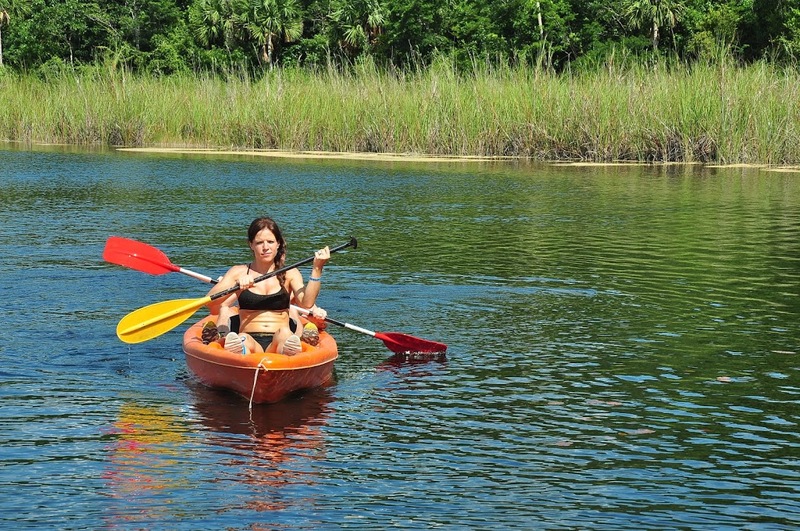 If you love staying active, and exploring on your vacation this would be the perfect trip for you. I am going to share the different aspects of our tour experience. Entering the Cave to swim in the Cenote. 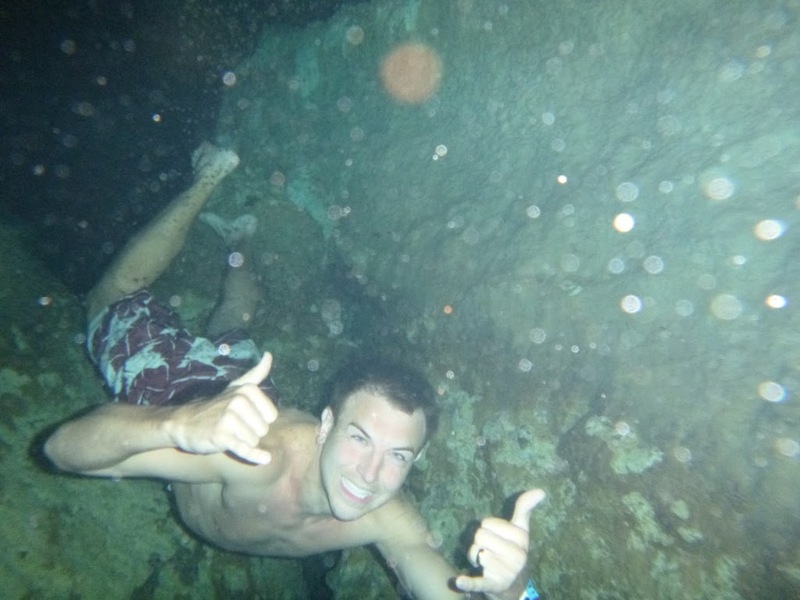 Jesse and I both agreed that the best part of our trip was entering and swimming in a Cenote. 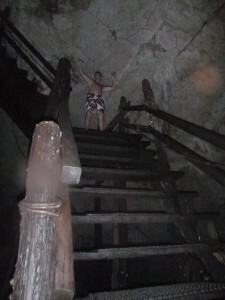 This was an amazing experience, and on a future trip we would like to explore more cenotes. The photo above was the cave entrance into the cenote. The entrance was very narrow, but as you can see in the photo it opened up to a staircase. The water of the cenote was gorgeous and clear. We kayaked and hiked through the jungle to get to the cenote, and the water was refreshingly cool. We showered before entering the cave, to prevent contamination of the water with sunscreen and insect repellent. 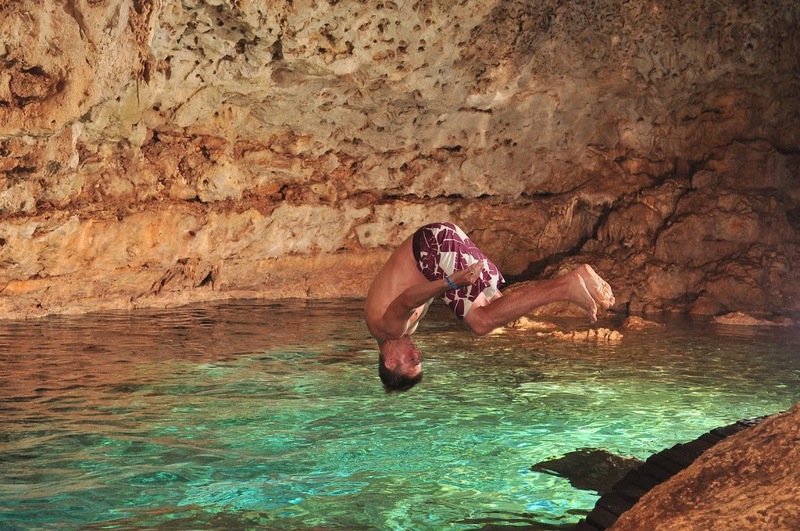 Jesse did a flip into the crystal waters of the Cenote. I danced into the Cenote. In the Cenote. The water was amazing and clear. Jesse underwater swimming in the Cenote. I definitely recommend bringing an underwater camera on your trip. You can see how amazing the water was. The water was deep, but you could clearly see down to the very bottom. 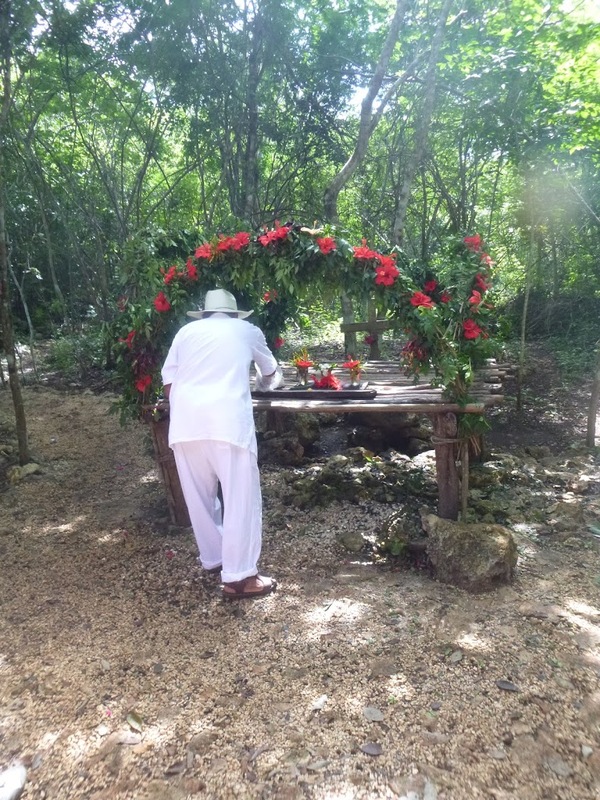 Prior to entering the cenote we participated in a Mayan Purification Ritual. The ceremony was beautiful, and hearing the Mayan language was an experience in it’s self. Danique was able to explain the ritual, and some of the beliefs of the Mayan culture. After swimming in the cave we returned to the Mayan Village and ate a delicious feast prepared by the Mayan people. The food included: vegetable soup, black beans, rice, spaghetti, empanadas, chicken, tortillas, hibiscus tea, and a yummy juice. I was so busy eating the delicious food that I forgot to take pictures! 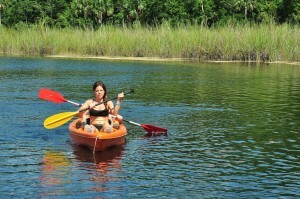 Kayaking through the jungle to get to the Cenote. Later we ziplined over this area. 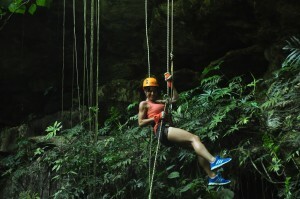 Another highlight of our tour was rappelling down into the Cenote of Life. Some of the members of our tour group were very nervous, but everyone conquered their fears, and lowered themselves down into the cenote. 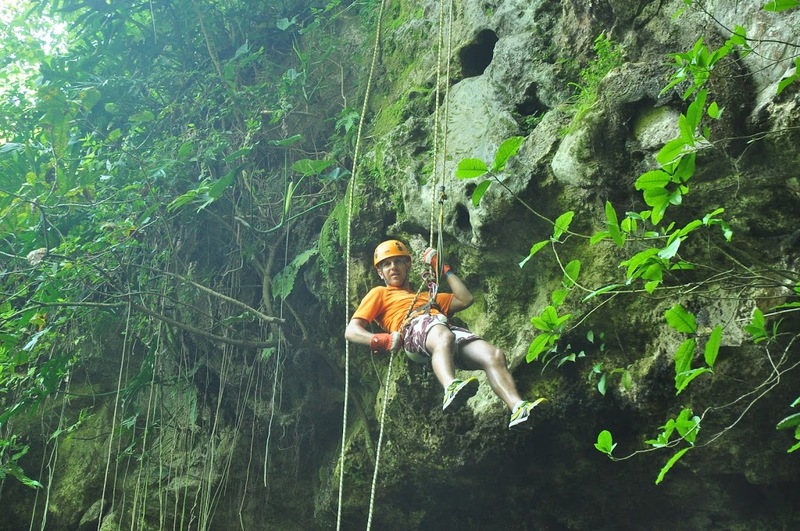 Rappelling down into the Cenote of Life. Jesse Rappelled like a Pro. Ready to ride the Zip Line. After lunch we took a short drive from the Mayan Village to the ruins of Coba. Coba is an experience in it’s self and I could have easily spent an entire day there exploring the ruins. I am going to make a separate post about the Coba portion of our trip. It was wonderful to be able to experience parts of the Mayan culture, while supporting it’s people. Jesse and I both agree that this was a 5 Star experience. I would love to take another of their tours in the future. Looks like you had a great time Melissa! Tan looks good! Amazing pics! This place is awesome and looks like you are had much fun over there. Thank you! It was a fantastic trip, and we had an amazing time. 🙂 It looks like your company offers some amazing tours and experiences as well! I just got back from the exact same tour and I agree, definetly 5 star and just thought the whole day was so interesting and amazing !! Great pictures. 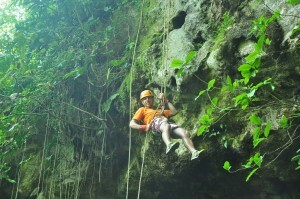 I brought my underwater camera as well and grabbed some great video zip lining. Thanks for sharing.